In which an astonishing title for a Doctor Who story is wasted on a bunch of farting CGI aliens. But has time made it any better? Let’s find out. So, I’m very, very slowly working my way through the “new” series of Doctor Who, new in this case meaning the show’s revival from 2005 onwards. And I’ve come to the episode that, before I started on Christopher Eccleston’s one and only season was likely to either come last or second last, based on my memories of the episode. If you’ve read my recap of Aliens of London, you’ll get why. Still, that episode in some limited ways was actually better than I remembered, largely because of the drama that played out around Rose’s abduction-that-wasn’t, rather than the Slitheen that were. So, onto the second part, World War Three! I like a challenge, and I don’t remember liking this episode much, so I’m setting myself a rather peculiar one. To be specific, I’m watching this episode while in transit to Paris for a work event. Plenty of time to kill, but it does mean I’m once again watching it via a streaming service — in this case, Stan rather than my preferred Blu-Ray version. It’s not out of the realms of possibility that an airline might have a few episodes on tap for the inflight entertainment system, mind you. Although they all seem to love Big Bang Theory episodes, and I can only assume that’s to make watching the inflight tracker for 24 straight hours seem exciting by comparison. We open with a recap, although this might be streaming exclusive. There’s a lot more focus on recapping the Slitheen story, which I’m not a fan of, rather than Rose’s return to London. Also the lightning effect that attempts to electrocute The Doctor looks a LOT like the quickening. Connor McLeod being a Time Lord makes more sense than that “Planet Zeist” nonsense. Not that ever made any sequels, mind you. Christopher can resist the electrocution, because he’s not human. The Slitheen don’t like the zapping though, which is one of (many) flaws in their plan. Roll the credits! At least we know the Doc is OK, but what about Rose, Harriet Jones and, of course, Jackie? Is it a Deus Ex Machina cop out to have one Slitheen being electrocuted, so they all are? Well, I guess if the God in question is Thor, it just might be. Still, that feels a little lazy, or as if Russell T Davis wanted to present a stacked cliffhanger — the absolute first one of the new series — but then had to quickly get out of it in order to progress the general narrative. The Doctor doesn’t even check if any of the humans survived. Cold. Meanwhile, Rose and Harriet Jones (MP, Flydale North, just in case you’d forgotten) run past a Slitheen that just plain doesn’t work as an effect. Not so much the design (though I’m not a fan) but the shot composition and lighting, which makes it VERY obvious that they’re not in the same space together. Doctor Who effects would get better, of course, but this looked iffy then and it now looks even worse. Mickey walks into the kitchen to see Jackie spread out on the floor, while an alien erupts in lightning in front of her. Must be a Tuesday. So he hits it with a chair, but he’s no Pro Wrestler. The Slitheen barely sells it, and I’m not entirely sure why Jackie couldn’t have just run away regardless. Ah, Christopher. It’s a silly line, but he somehow makes it work, through sheer force of personality. Harriet Jones MP (Flydale North) remembers the emergency protocols, but it’s basically just an excuse for a good old fashioned Doctor Who corridor chase. Always a reliable way to fill a few minutes in an episode! The layout of Downing Street confuses me. Are Harriet Jones MP (Flydale North) and Rose on the second floor? Why don’t they run into the Doctor and his new soldier friends? Or a room full of dead alien experts and some Slitheen desperately trying to put their human skins back on? The Doctor is given plenty of time to point out that he’s in front of the lift. Also, FASTEST CLOSING LIFT DOORS EVER. And again, I cannot keep track of the levels of 10 Downing Street. It’s almost as if it’s being written with plot convenience, rather than logic in mind. But would that really happen? OK, so the lift says that there are at least 5 floors. And the Doctor must have been on the ground floor. The sergeant sounds very Welsh. Which is fine, of course, 10 Downing Street is free to hire soldiers from throughout the United Kingdom and all that. I’m sure it’s not that there were Welsh actors being used by BBC Wales at the time, right? Sigh, another fart gag. And this one’s in a lift. No, ‘naked’ in and of itself isn’t automatically a joke either. The Slitheen love hunting, but they’re rubbish hunters. Anyone fooled by someone hiding behind curtains or a door really isn’t trying that hard. Even if they do love the smell of human sweat and fear, you’d think they’d just catch their prey, especially with their bigger plan in mind, no? And then, these mighty hunters, these fearsome clawed aliens are temporarily beaten with… a fire extinguisher and a curtain. Oh dear. Another corridor chase, because why not? The Doctor improvises a pseudo-Molotov cocktail with the sonic screwdriver. Which is kind of neat — I can’t recall right now if he’s bluffing or not — but it does open up the world of “the sonic can do whatever the plot requires” into the new series. This won’t be the last time, either. Oh, that’s right, the Slitheen is the family surname. They’re Raxacoricofallapatorians. Because this episode wasn’t silly enough without names that are deliberately or obviously technobabble. Ah, the head Slitheen is questioning the Doctor’s bluff. OK, I DID laugh at that one. Harriet Jones MP (Flydale North) is nothing if not properly British and formal, even when facing alien disembowelling threats. At least The Doctor doesn’t use the Sonic to seal the Cabinet Rooms. Added bonus: I know where he is! Jackie and Mickey appear. I’m sure there will be no problem sneaking into the head of the nation’s government without issue for them, right? Various Slitheen — obvious because they’re portly actors — arrive, but the BBC broadcaster giving us their names says something you’d never say on a real news channel. You never admit you have “no idea” what’s going on — you’d always say “We’re waiting on further information”, or bluff to fill time until you did have an idea! 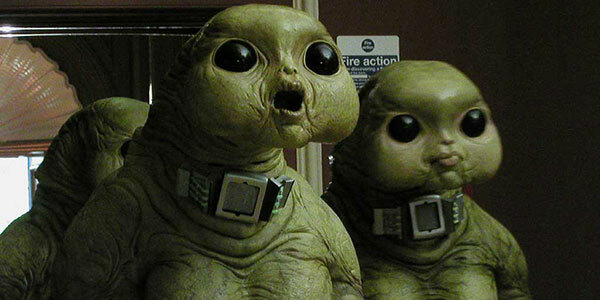 The practical Slitheen suits are… OK. It really does highlight the difference between them and the CGI ones when they’re on screen, though. Oh, Mickey and Jackie were heading to Mickey’s place. OK, that’s my second laugh for the episode. Predictably, Jackie is involved. Jackie brings it back down to a human level. Camille Coduri and Noel Clarke have a really nice scene here, amidst all the farting aliens. So the police sergeant is the only vaguely competent hunter. OK, third laugh. Harriet Jones MP (Flydale North) makes a great straight woman. The UN has control of the UK’s nukes? What…? “Harriet Jones. Why do I know that name?” – of course, at the time it didn’t mean as much, but it’s one of the earliest bits of cross-season foreshadowing for the whole show. Ahem, Doctor. What about… and I’m just saying here… BRIGADIER ALISTAIR GORDON LETHBRIDGE STEWART???? He’d know what to do! Oh wow. Old school Nokia camera phone. I’m not certain those phones would have handled that much light without blowing out the whole image, actually, but that’s my tech nerd side showing. Ah, we’re heading for UNIT now. If only online. What we need is Benton, or maybe Brigadier Bambera! Buffalo is a TERRIBLE password. Either UNIT or the Doctor has TERRIBLE password hygiene. Even back in 2005 we knew this! Jackie is WONDERFUL. She’s human reality in this otherwise silly farting alien story. Mickey wants to take on the Slitheen with a baseball bat. Maybe if it was Ace’s baseball bat, he’d stand a chance. The Slitheen is playing with them. It must be, because in Downing Street, where you’d presume the doors would be solid wood, the Slitheen could burst through them like paper. But in a suburban council flat, most likely with cardboard filled doors, a Slitheen is doing a worse job than Jack Nicholson in The Shining at getting through. Not even my general joy at Christopher Eccleston’s performance can make me enjoy “Raxacoricofallapatorius”. Sorry, but it’s just never going to happen. And now, our war of the worlds moment, because it turns out that vinegar is deadly to them. Of course, the Slitheen has to fart before it dies, and Jackie and Mickey end up being slimed, because gunge is funny, kids! Also, the Doctor, Rose and Harriet Jones MP (Flydale North) let out a sigh of relief, but all they’ve heard is a fart and a squishy sound. For all they know, that’s the Slitheen dragging Jackie’s entrails across the kitchen floor! “Massive Weapons of Destruction” — quite topical for 2005, of course, as is the course of warmongering that The Doctor should be opposed to. But this whole business of the UK giving up its nuclear arsenal is so wafer thin that I just don’t believe it. Margaret Slitheen is easily the best at being creepy. That’s of course relevant later on in the series. A little menace goes a long, long way. I mean, yes, we’d be at war with aliens (we think, it’s all a con, but bear with me), but interplanetary suggests that we’d be able to take the war to them. Which we couldn’t. At best, we’d be defending ourselves by flipping a few nukes into the atmosphere, but any conventional 2005-era weapons would take literal light years to reach their targets. That’s going to be easy to dodge, then! Another damned fart gag. And the Slitheen are giggling like Batman ‘66 villains. The Doctor has to put Rose into danger, and he’s got to face Jackie about it. While the music is a bit soap opera, this is so out of whack with the tone of the Slitheen that even it starts to topple. Harriet Jones MP (Flydale North) is in command. And she’s rather good at it, actually. Apparently the TV news gets to know about UN resolutions before UN partner members. How does that work? The Royal Navy too can be hacked with “The buffalo password”. Sheesh. This is poor. Really poor. The world is in Mickey The Idiot’s hands. But not Ricky the Idiot. So I guess we’ve got a chance! Yeah, I totally don’t buy that the UK Prime Minister’s red emergency phone wouldn’t ring before the US news knew about any of this. As if I needed even less suspension of disbelief! This incoming missile is taking the slow, taxi driver route to 10 Downing Street. Of course Jackie can see the missile flying through the air. It’s just crawling along now. And the Slitheen are arguing about which skin suit to wear, because, well, the STUPID IS MULTIPLYING. Big Boom. And the Slitheen are blown to bits, which means I never have to see them again, right? Right? RIGHT? Sigh. Yeah, I know, that’s not true. If I didn’t know better, I’d say that exploded 10 Downing Street was an unconvincing backlot prop. But of course, it’s not. “Harriet Jones, future Prime Minister, elected for 3 successive terms, the architect of Britain’s Golden Age”. Now, of course at the time that was just a cute line, but it strikes me that given future episodes — and a 5 year UK government term — it throws a lot of continuity problems into the mix. Something tells me Harriet Jones MP (Flydale North) doesn’t make her last appearance 15 years down the track in Earth terms, because that would be 2020. Yeah, I really didn’t appreciate Jackie the first time around. The Doctor is a bit of a prick about Jackie and her dinner offer. Christopher makes it work, because he’s meant to be alien — although of course by this stage in the show’s history, he knows plenty well about families and earth customs. I guess we can call it post-Time-War PTSD? The interplay between Jackie and Rose is easily the best thing in this episode… but that is in NO way hard, and it’s just not enough to save this stinker of an episode. First clunker of the new series, but then, I’m happy enough — because I know what’s coming next! Next time: They’re back… and in perhaps their best episode EVER.